The Elm is a wonderful 4-bedroom detached homes extending to approximately 174 sqm / 1,873 sqft. This super family home offers ample accommodation consisting of entrance hall, spacious dual aspect kitchen with French doors to the patio, large lounge with dual aspect, study, utility, guest W.C., 4 generous bedrooms (master bedroom with dressing room and ensuite off) and bathroom. (image used - The Ash). Deerhurst are creating a delightful new addition to the village of Coill Dubh - Hawthorn Manor is a small development of 53, mostly three and four bedroom, family homes just on the edge of the village. 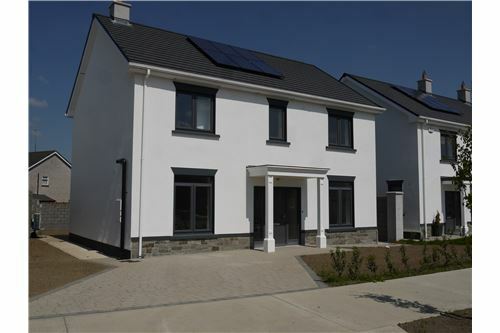 Online bidding: https://beagelbid.ie/property.php?id=286 The Elm is a wonderful 4-bedroom detached homes extending to approximately 174 sqm / 1,873 sqft. This super family home offers ample accommodation consisting of entrance hall, spacious dual aspect kitchen with French doors to the patio, large lounge with dual aspect, study, utility, guest W.C., 4 generous bedrooms (master bedroom with dressing room and ensuite off) and bathroom. (image used - The Ash). Further details available at https://hawthornmanor.ie/ The country life on Dublin’s doorstep. 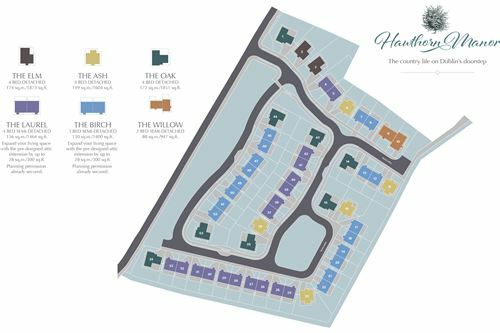 Deerhurst are creating a delightful new addition to the village of Coill Dubh - Hawthorn Manor is a small development of 53, mostly three and four bedroom, family homes just on the edge of the village. These luxury A2 and A3 energy rated homes feature the very latest in terms of building, quality and design innovations. Organised around two landscaped green areas, the development is laid out to maximise safety and privacy with a long-term view of a sustainable neighbourhood in a beautiful setting. The six different house types, designed by John Cross Architecture, are of exceptionally generous size, ranging up to 174sqm/1873sqft. Hawthorn Manor homes are meticulously planned for comfort, to maximize space and to give you the very best in terms of functional layout. The development also reflects the fact that because families grow your home should too. Over half the houses have been designed with upward expansion in mind, featuring attics suitable for conversion to accommodate an additional en-suite bedroom of over 28 sqm / 300 sqft. This optional extra is available on request or can be easily adapted later at a time that suits your needs. Every detail has been considered, from the sandstone pavers in the private patios to the wood burning stoves in the living areas and the modern kitchen to the plentiful storage space throughout. The idyllic pastoral village of Coill Dubh, with some 700 residents, offers all the essentials for a quiet life: a shop, a national school, a church, a post office and of course a local pub. Yet, lying just 10-30 minutes drive from many of the main towns of County Kildare and less than 40km from Dublin City, it offers easy access to all the attractions of modern life. The community is very well placed in terms of commuting to and from the capital: - by car, in 25 minutes to M50 - by regular Bus Eireann service, from the Coill Dubh, bus stop just 2 minutes walk from Hawthorn Manor - by train, from nearby Sallins Station (14km away). Given this location, the area is set to grow as more and more people seek a quieter life and more value for money in their purchase of homes. Indeed, there is a definite air of renaissance in the area with the turnaround in the economy and the Dublin effect reaching beyond the capital. The region is notable for new ventures such as the Runamuck fun run, new amenities such as the colourful new playground at Timahoe, the further development of family attractions like Lullymore Heritage Park, the increasing popularity of mature landmarks like Coolcarrigan Houses’ 15-acre gardens and Irish National Stud s acclaimed Japanese Gardens and the development of nature reserves and board walks. Coill Dubh itself is a decidedly relaxed setting, surrounded by birdsong-filled hedgerows, verdant farm fields, vast stretches of peatland nature reserves and famous archaeological sites. Its’ wide-open spaces mean activities like hurling, football, cycling, running and nature walks are popular pastimes. This truly is a perfect place to experience the quiet of country life without forgoing the wider world. The tranquil banks and hump-backed bridges of the nearby Grand Canal provide ideal settings for leisurely walks. The nature reserves around the area provide a fascinating backdrop to modern life, linking residents to both nature and history. Living in Coill Dubh will put you at the heart of a vibrant area of County Kildare, with nearby towns including Clane, Naas, Maynooth, Leixlip, Sallins, Kildare and Newbridge. The nearest town Prosperous, a mere five-minute drive away, offers a wide range of shops, cafes, restaurants and pubs. As well as the local Coill Dubh national school, there are three primary schools and a secondary school in Clane, an excellent school in nearby Naas and Clongowes College is a 10-minute drive. Maynooth University lies just 20 minutes from Coill Dubh village. Situated down tree-tunnelled and cottage-lined country roads, away from the hustle and bustle of city life though still within easy reach of all that modern life demands, we found the perfect location. And for this perfect location, we have gone that extra mile to build houses of the highest standards in terms of energy efficiency, natural light, spaciousness, attention to detail, and durability of material well exceeding all your expectations. We believe our houses represent a perfect chance for you to own your dream home at an affordable price. 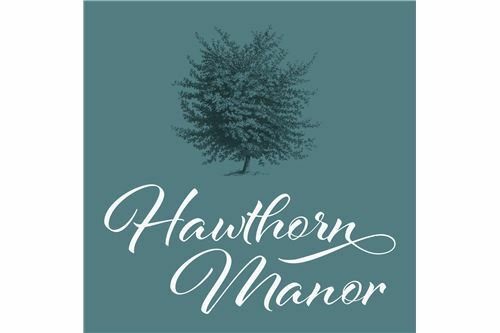 We hope you can come and see for yourself, and that you are as enthusiast is about Hawthorn Manor as we are. The Deerhurst Team. EXTERNAL FEATURES Plaster facades with selected stone plinths High performance UPVC windows Feature porch Indian sandstone paved patio area to rear garden Seeded gardens, with solid block divider walls between gardens Quality paved front driveways to accommodate two off-street parking spaces ENERGY EFFICIENCY & HEATING A2 and A3 BER energy rating Solar photovoltaic panels on the house roof to generate additional electricity High levels of roof, walls and floor insulation Low U-value argon filled external windows High performance internal pipe insulation to reduce heat loss Air to water heat pump central heating and domestic hot water system with thermostatic zoned heating control Wood burning stove in living room SECURITY & SAFETY Smoke detectors fitted throughout (mains powered with battery backup) Carbon monoxide detection Hard wired for intruder alarm system Triple locking system to all windows and doors and complying with Part B of the Building Regulations ELECTRICAL & MEDIA Telephone/Data points in all living areas TV connection point in all living areap Main infrastructure installed to accommodate EIR or other provider Generous lighting and power points BATHROOMS High quality tiling to foors and wet area walls in main bathroom and en-suite bathroom Contemporary showers and bathroom fittings Heated towel rails to all bathrooms High quality sanitary ware WARDROBES & STORAGE Contemporary fitted wardrobes Modern fitted kitchens Provision for fully integrated kitchen cooking and fridge/freezer appliances Stainless steel sink draining board and mixing tap Separate utility room with provision for washer and dryer Storage in compliance with DOE standards INTERIOR DETAILS High quality engineered timber doors Contemporary grooved architrave and skirting High quality tiling to floors and wet area in main bathroom and en-suite Painting throughout Superior quality internal joinery with hard wood handrail to stairs Pull down airtight attic ladder fitted ‘Future-proof’, convertible attic space to House Types Birch & Laurel DIRECTIONS: From Clane proceed out the R403 towards Prosperous, continue straight through Prosperous for approximately 3.1km to Dag Welds Cross (note public house on your right), turn right, drive for approximately 1.3km turn left, continue for approximately 300 meters, Hawthorn Manor will be on your left hand side. GPS 53.289097, -6.821298.